Seventy-five years ago, residents of the Ottawa Valley were shocked at the news that Sergeant John “Jack” Billings, a decorated veteran and game warden from Barry’s Bay, and his guide, Joe Stringer had possibly been murdered in the bush south of Whitney. For weeks, newspapers in Eganville, Pembroke, Renfrew and Ottawa carried reports on the tragedy and the investigation. Headlines such as “FIND CHARRED BODIES AFTER SHACK BURNED” from the Ottawa Citizen ignited the imagination of readers. News reports were filled with drama and suspense, recounting the details of the search for the missing men; the discovery of human remains; the pursuit and arrest of the suspect; and the revelations made at the inquest. While all of this news was titillating for the general readership, it must have been hard to take for the families and friends of Jack Billings, Joe Stringer and the suspect. One member of the Billings family carefully clipped and preserved a variety of articles regarding the tragic and mysterious death of my great uncle Jack, and years ago I discovered a box of old clippings and photographs in the shed. This discovery began a life-long interest in genealogy and local history. Thanks to the “Reflections” page of the Eganville Leader, Ottawa Valley residents are able to learn about their own history. This month, details of the Billings-Stringer case are appearing in the “Seventy-five Years Ago” column. I’m hoping that my article will put a human face on this story. Jack Billings was born in Brudenell Township in 1879. His parents, John and Catherine Billings had recently arrived there from Bromley Township. After the death of his mother in 1880, Jack was sent to live with his maternal grandparents in Bromley Township. In 1890, his father remarried and the 1891 Census indicates the family had been reunited and was in residence at Bark Lake in Jones Township. Little is known about Jack’s early years, but we can assume that he assisted his father in the management of the Billings Stopping Place along the Opeongo Line at Bark Lake and later at the Billings Hotel in Barry’s Bay. Jack also found employment in the lumber camps. His name appears in a lumber camp’s monthly time book held by the Champlain Trail Museum in Pembroke. Jack worked in camp No.1 during the 1899-1900 season, making $14 per month. Unfortunately the book does not identify the lumber company or the location, but John Culhane was the foreman. It may have been in the vicinity of Aylen Lake given the presence of other local surnames in the time book. 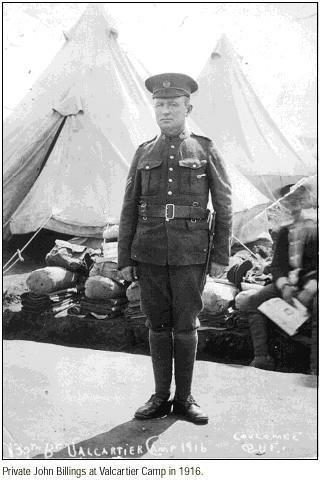 Jack enlisted for military service on April 25, 1916 at Renfrew. He listed his occupation as “bushman” and the military physician recorded and axe scar just above the ankle on his left leg. He embarked on the SS Lapland at Halifax and arrived at Liverpool on October 16, 1916. On arrival in England, Jack was temporarily assigned to the 12th Battalion which was stationed at West Sandling. A month later, he was transferred to the 38th Battalion and sent to France. Stories in the Billings family suggested that Jack had been recommended for the Victoria Cross, the highest military honour in the Empire, but had lost it after getting drunk, stealing his colonel’s horse and riding off to a French village to see his girl. There may be some truth to this story since the November 15, 1918 issue of The Eganville Leader reported that John Billings of Barry’s Bay had been recommended for the Victoria Cross. 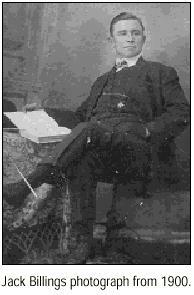 The article states that, without concern for his own safety, he had saved the life of a Renfrew boy named Alf Anderson. Jack’s service record contains no mention of the Victoria Cross; however, there is a detailed account of the heroism which earned him the Distinguished Conduct Medal. 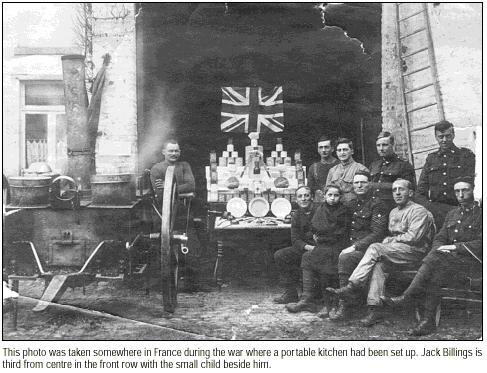 The Unit War Diaries at the National Archives of Canada reveal that on September 29, 1918, Jack’s battalion was involved in fighting around the villages of Inchy and Bourlon near the Marcoing Line. This region is close to the Belgian border and not far from Vimy. At sunrise, the battalion attacked the enemy and despite intense shelling and machine gun fire was able to cross a road of strategic importance. Soon after securing their position, the battalion was faced with a counter-attack. In the melee all of the commanding officers were wounded or killed, so Jack assumed command of the company. In his struggle to repel the counter-attack, he moved three Lewis guns into place and began to operate one himself. When this gun was destroyed by hostile fire, he moved on to the second and continued to fire. When this gun was also destroyed, he opened fire with the third gun, and despite heavy machine gun and sniping fire, was able to keep the gun in action. Consequently, the counter-attack was repulsed. Early in May of 1919 Jack returned to England, and a month later he departed from Southampton aboard the SS Olympic. He arrived in Halifax on June 12 and in Ottawa on June 16 where he was discharged. Later that summer he was presented with the Distinguished Conduct Medal by the Prince of Wales (later the Duke of Windsor) in a ceremony on Parliament Hill. One year later, the Belgian Ambassador in Ottawa forwarded the Belgian Croix de Guerre to Jack in Barry’s Bay. Jack returned to Barry’s Bay where he worked in the various family business interests: the hotel, the post office, mail and livery service. In 1918 his father had purchased the hotel in Killaloe and for a time after the war, Jack was manager. By 1925, he had left the Killaloe hotel in the hands of his brother and sister and had become a game warden. In August and September of 1925, Game Warden Billings appeared in several articles in the Eganville Leader. Referring to him as “the old War Horse” some of these attest to his excellence as a baseball coach and umpire. Others refer to his exploits as a game and fisheries inspector. In September alone he brought an Ottawa furrier to justice and had a prisoner escape from a room at the Madawaska hotel. Gwen Woermke of Barry’s Bay, Jack’s niece who was three at the time of his death, recalls her father Mark Billings telling her that Jack visited their home and played with her two-year old brother Keith on the morning of January 8. Later that morning, he met his guide, Joe Stringer and they boarded the westbound train for Whitney. Jack had made his plans known to his brother. He and Stringer were heading to an area south of Whitney to search for a Whitney trapper who was poaching in that region. They expected to be gone for three or four days. After a week had passed, Mark Billings was dismayed to learn the two men had not even returned to Whitney. He contacted the Department of Lands and Forests and the police in Pembroke and began to organise a search party. Several theories were posited: the men might be lost or delayed due to a mishap; they might have fallen through the ice and drowned; or they might be the victims of foul play. According to the reports of the day, the trapper that Jack was pursuing had threatened his life after an earlier arrest. The search party left Whitney on the morning of January 20 and within a short time discovered a grisly scene on Birch Creek, 13 miles south of Whitney; a burnt cabin and charred human remains. Underneath some bones, a ring of keys, a wristwatch and a revolver were discovered and identified as Jack’s. Other items were found which were positively identified by Stringer’s widow. A shell casing of the same type sold by a Whitney storekeeper to the illegal trapper was discovered among the ruins. Also, several snares were found under Stringer’s remains. Footprints led from the clearing to another cabin some miles distant on Hay Lake, which was known to be frequented by the poacher. A native trapper in the vicinity claimed to have seen flames in the sky on the night of January 9. As a result of these discoveries, the police suspected a double murder and issued a warrant for the arrest of the Whitney trapper. Six days later, as Police Inspector Stringer was leading a search for the suspect deep into the bush, the wanted trapper reappeared in Whitney where he was arrested, without a fuss. The suspect claimed he had been in Whitney on the day of the deaths, a story which was corroborated by the testimonies of his grandmother, his uncle, and a Whitney resident who had seen him at Post’s store on January 9. He then left for the Sand Lake area where he spent a week tracking two fishers, and at the time of his arrest was able to present the two pelts. He claimed that he knew nothing of the deaths of Billings and Stringer until he found a note left by his father at a cabin on Sand Lake. Realising that he was wanted on murder charges, he returned to Whitney where he was arrested on January 26. The suspect was detained first at the hotel in Madawaska where he was questioned by Police Magistrate Chown and later at a Whitney boarding house where he waited for the inquest. The inquest was concluded on Friday, February 5 with Magistrate Chown giving the Whitney trapper his freedom. Prior to the inquest the remains of the two men had been released to their families. Jack Billings was waked at the Billings Hotel in Barry’s Bay. Mrs. Woermke has a very vague recollection of her uncle’s wake held in an upstairs parlour at the hotel. Father Clarke, the curate of St. Andrew’s in Killaloe and the mission of St. Lawrence O’Toole in Barry’s Bay, made a very detailed entry in the parish register regarding the funeral of Jack Billings. It was held at St. Hedwig’s Church in Barry’s Bay at 9 a.m. on Wednesday, January 27. Newspaper reports concur with this priest’s account of a funeral so large that the tiny mission church of St. Lawrence could not accommodate all of the mourners and onlookers. Captain Rev. William Murray from Campbell’s Bay celebrated the funeral mass assisted by five former military chaplains. The sermon was delivered by the former senior Roman Catholic chaplain of the Canadian Forces in the Great War, the Hon. Lieut. Col. Rt. Rev. F.L. French. With a full military funeral including the Last Post and a firing party consisting of comrades, Jack Billings’ remains were interred in the Billings plot in St. Lawrence O’Toole cemetery. 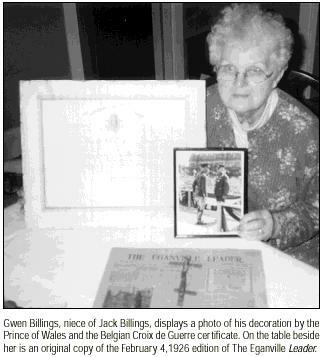 For many years, a photo of Jack Billings receiving his decoration from the Prince of Wales in 1919 occupied a place of honour in the office of the Balmoral Hotel in Barry’s Bay. This photo, other photos in the family album, the family gravestone and some stories were all that kept Jack’s memory alive. 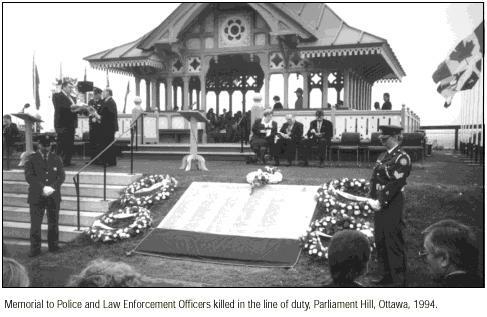 However, on March 22, 1994 a memorial was unveiled in Ottawa just behind the Center Block of parliament. Erected by the Canadian Police Association, this granite memorial displays the names of police and law enforcement officers, including game wardens, who have lost their lives in the line of duty since 1879. Included among the inscriptions is “Game Warden John Billings, Ontario Department of Game and Fisheries, 1926.” As the closest living relative of Jack Billings, Gwen Woermke attended the dedication ceremony. An ordinary “lad” from the Valley, Jack Billings spent his youth in a stopping place where rough and tumble lumbermen would whet their whistles and spend the night enroute to and from the camps. As a young man, he worked in the camps himself and was known to enjoy a stiff drink, an occasional fight, and the ladies. As an adult, he went off to war and almost single-handedly fended off an enemy onslaught. Later, he would distinguish himself as a strict yet fair-minded game warden and be described as a “genial Irishman” with a ready wit and a quick temper. In the end, he died in a log shack in the bush under mysterious circumstances. Last year a fellow researcher who had come across a reference to Jack in an old Eganville Leade r, e-mailed me the question“Who was Jack Billings?”To answer her question: just another one of the colourful characters in the history of the Ottawa Valley. Mark Woermke teaches in Ottawa. He is researching/writing a book on these mysterious deaths.